The SIU Foundation mailers have gone out for the golf tournament benefitting the Clemens Scholarship on May 8th. Get your team together and come out to play at the Orchards in Belleville. Thank you to everyone who donated to today's shoe and toy distribution in Jennings, it was a huge success. Thanks to World Press, Catco, Mastercard and CCMSI for their generous support. Beth Boggs will be a speaker at the Uninsured/Underinsured Motorist Law Seminar on April 5th, 2019 in St. Louis. 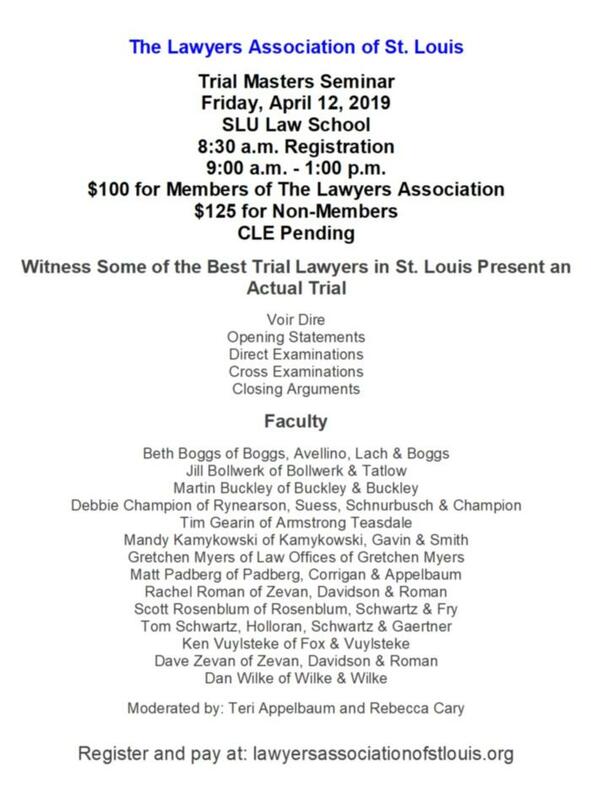 Beth Boggs will be a speaker at a CLE on Wednesday, December 19th, 2018: "Managing Jurors in Catastrophic Personal Injury Claims — Voir Dire, Jury Selection and Countering Sympathy." Click here for more information and to register. The Step It Up golf tournament was held on June 30th and was likely the hottest day we have ever had a tournament. It was great, despite the weather. Thanks to the snow cone truck and the Locos Taco truck for coming out to help smooth the day over. Thanks to all of the players, sponsors and volunteers. Thanks to BSPLaw for their contributions. Zero Friction will be back for the next event. Thank you to everyone who volunteered and assisted at the October Step It Up shoe distribution. The kids loved the new shoes, books and toys. The SIU Foundation to support the Clemens Scholarship for female law students at Southern Illinois University at Carbondale, was held at the Orchards in Belleville on May 8th, 2018. Thanks to everyone who sponsored, donated, volunteered and played. It was a great success and we will be awarding our first scholarships this fall. The next tournament is June 30 at the Orchards. Beth Boggs and the Honorable Nanette Baker recently spoke at the WLA Mentorship Lunch, hosted by Dowd Bennett, LLP on December 8th. Thanks to everyone who came out to support the Gateway Grizzlies and met baseball legend, Bernard Gilkey. Beth Boggs recently moderated a panel entitled "Class in Session: Defending Putative Class Actions" at the NAMWOLF annual conference in New York. Beth Boggs recently spoke on Combatting Plaintiff's Reptilian Tactics. Beth C. Boggs was invited back to be the auctioneer at the prestigious BSP Cornerstone Golf & Tennis Classic on July 24, 2017 in Birmingham, MI. It was a fantastic event, made better by the First and Second place finishes in the tennis tournament. Kudos to Cheryl Bush and her team for their efforts for the Detroit community. The next tournament will be May 8th, 2018 at the Orchards in Belleville. Contact Courtney Stevens to sign up to play. The October 6th tournament was fantastic, great food and weather. Steve Cori went the extra mile on the lunch offerings, as usual. Rich Donner's team dominated the scoring. The firm will be coordinating and co-sponsoring the WLA golf tournament on May 8th at The Orchards in Belleville, Illinois. The firm golf tournament was held on October 7th, 2016 at The Orchards Golf Course in Belleville, IL. Great weather and a full course with many left over hidden golf balls. Beth Boggs recently was a panelist on the topic of "Mediation Advocacy: Techniques to Resolve your Case" for CLM on August 3rd, 2016. The firm assisted in hosting and was a presenting sponsor of the WLA golf tournament on May 9th at the Orchards Golf Club in Belleville, Illinois. Beth Boggs was recently a panelist in New Orleans for "Ready for Action? Hone Your Expert Cross-examination Techniques." Beth Boggs recently spoke at a CLE in New Orleans on 2/21/16, the topic is "Challenging Experts? Tactics for Mastering Expert Examinations"
Beth Boggs spoke at a seminar on Insurance Policy disputes and 537.065 agreements on March 13, 2015 at Washington University. Beth Boggs was an author and contributor the Rules of Evidence: A Practical Tool Kit on June 25, 2015, in Collinsville, Illinois. Robert K. Kerr spoke at the seminar entitled "Anatomy and Physiology 101 for Attorneys" in Collinsville, Illinois, on 4/29/15.